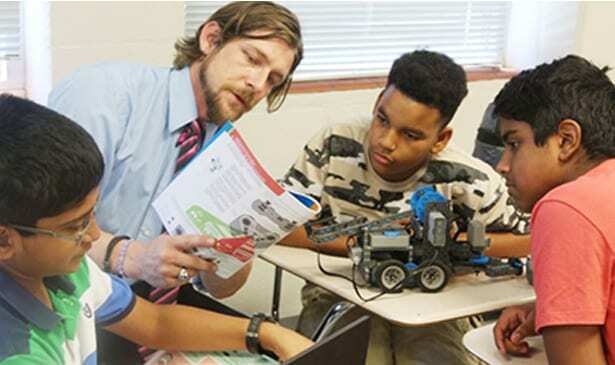 NASHVILLE, TN (TSU News Service) — Summer is here, and that means the start of TSU camps and programs that allow youngsters to have some fun, engage in educational enrichment activities, as well as gain real-world experience. This year, nearly 1,500 students from kindergarten through college freshmen, coming from as far as Maryland and California, will participate in more than 40 summer camps and programs on the two TSU campuses. Among them is 13-year-old Adia Diane Gonzales, one of more than 400 students in grades K-8 participating in the Minority University Research and Education Program, a two-week NASA-funded camp that teaches children to design, build, and program robots. The project includes learning simple mechanics, sensor functionality, programming basics, and automation. “This is just fascinating,“ says the H.G. Hill Middle Prep School 8th-grader, as she and her teammates use remote-controlled devices to command robots they built in just the first two days of the camp. Gonzales, who up to attending MUREP had not quite settled on what she wants to become, says she is hooked. “I wanted to be a surgeon, an animator or an artist. I have never built a robot before. But now being able to actually have some experience in building robotics and coding has me interested,” she says. And that’s the goal of the MUREP program, says Dr. Trinetia Respress, principal investigator of the project. “The purpose of the MUREP program is to stimulate the minds of young children who would not otherwise consider a career in STEM,” says Respress, who is also interim assistant dean for assessment and accreditation in the College of Education. “Our belief is that if we expose them early to STEM concepts, they will consider attending TSU and majoring in a STEM discipline,” she says. In the College of Engineering, 11 high school seniors are getting a head start on college work. They are participating in the Engineering Concepts Institute, a four-week pre-college, residential program intended to prepare participants for academic success in the mathematical sciences or engineering disciplines. Participants in the ECI program are incoming freshmen who have been accepted to attend TSU in the fall. Returning for the second year is the Verizon Innovative Learning Summer Camp, which runs from June 4-15. Intended for students ages 10-14, the Verizon camp allows minority males in grades 6-8 to interact with technology. Another returning favorite this year is the Summer Apprenticeship Program, or SAP, offered by the College of Agriculture. It is a science-based initiative for college freshmen and rising high school seniors that exposes them to cutting-edge research. It runs from June 11 – July 13. Thirty students from 10 states will participate in the program this year. For those into music and the arts, the Community Academy of Music and Arts, or CAMA, is hosting various camps in music, piano, drama, and visual and literary arts. The camps are designed to expose participants to different artistic mediums, crafts and songs. In addition to early learning activities for kids 5 years and up — such as Little Tigers Football Camp, and Basketball Kids Camp — summer camp themes and subjects range from science, applied mathematics and engineering, to music, athletics, real-world scientific work, and cutting-edge research. Aspiring young writers also have a chance to hone their skills in the Little Authors Camp, which runs June 11-15. Other summer camps are the Biotechnology Summer Camp (June 10-15), CAMA Blues Kids Camp (7/2 – 7/6), Joe Gilliam Football Camp (6/5 – 6/11), Edward L. Graves Summer Band Camp (6/23 – 6/30), STEM Summer Camp (6/24 – 6/29), and Upward Bound Program (6/3 – 7/6), among others.